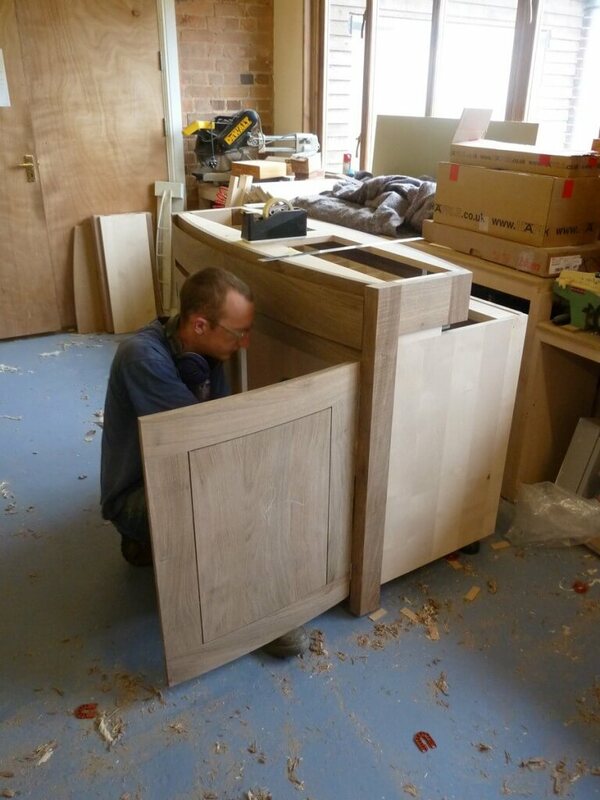 The workshop has had just one focus and one project since August – our English walnut and sycamore kitchen which is bound for the outskirts of Bath. In that time the seasons have changed from Summer to Autumn and I don’t feel I’ve even looked up. The deadline was always tight and by the time we landed this fabulous commission we were already starting 3 weeks late, time we hoped to make up during the 8 weeks of making. The kitchen is part of a complex refurb of a stunning Georgian House, so timing and schedules really can’t be stretched without all sorts of knock on effects. If you saw the last ‘Around the Workshop’ post you will have read the ups and downs (mostly downs) of using English walnut. Sure enough most of that has come to pass – I love this stuff but the firewood pile has consistantly been 3 times bigger than the component pile. So we have had to go out and find more, that’s never easy at the best of times. Luckily i’d been speaking to contacts in the business just in case we did run low, so I called in some favours and parted with more cash. Although the outer doors and surfaces are all English walnut, the internal carcasses and frames are all made of solid sycamore, another favourite wood of mine. It’s great to be able to make all of a kitchen in solid native timbers, from a making point of view it’s the ultimate challenge, something we could all really enjoy getting stuck into. As always my design work incorporated lots of curves so that adds to the making challenge. Curves also mean we have had to cut our own ‘saw-cut’ veneers so they match the solid straight components. 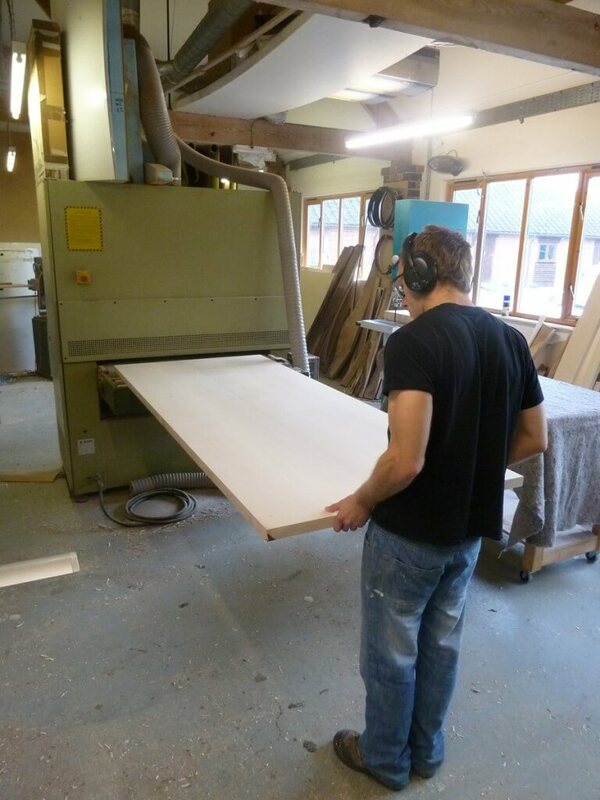 Essentially we make a our curved doors by slicing up pieces of thick timber into veneers through the bandsaw, (around ten 2mm pieces out of 2 inch stock.) We then re-glue them over a curved mould. It makes an incredibly strong, light door but it is time-consuming, particularly if you have lots of different radius curves to make. 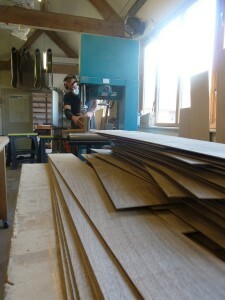 It’s another thing we have become very good at – but it has been made a lot easier with the big dimension sander. The design detail on all the doors and drawers has a 3mm shadow gap around the framed centre panel. Its a bit of a play on a traditional frame and panel door, but as always we are playing with subtle twists – using traditional form and proportion in a very contemporary way. It’s not minimal, instead we are trying to bring the best out of this wonderful timber. It’s been a bit of a baptism of fire for Connor our new apprentice, straight in at the deep end, but he’s done well. When the pressure is on like this we probably don’t have as much time as we like to talk him through stuff and put each process in context. As a result he has ended up doing things that make no sense at all until a couple of days later. I’m always saying to him and other people we have trained over the years, that a critical part of being a good maker is the ability to be thinking about a dozen processes ahead of what you are doing now. That comes as second nature to John, Mike and I (most of the time), but for someone out of a school environment used to being taught in a systematic way to pass an exam, that’s a giant leap. The great thing is you can see those eureka moments on Connor’s face when it all falls into place. Or perhaps it’s a sense of relief that the people he’s working for aren’t mad after all! We have already part fitted some of this kitchen, partly because the lead time between granite templating and fitting was so long. So two weeks ago we got all the base cabinets in ready for templating. We are back on site next week to fit wall units and the island. That will coincide with the granite fitting. We still have one or two elements to finish after that, the main one being the free standing cabinet for recycling bins. Again, rather a nice piece in English walnut and sycamore for this unglamourous job. That will be complete by the end of the month and see a conclusion to this project. We have loved making it, but I’m sure it will run over time. We have also been working long hours, including weekends, and are all knackered. So for us and the clients its conclusion can’t come soon enough. We have been filming the making and fitting of this project so there will be some video in a month or two, as well as the usual still images. Mind you I’ve not photographed the last kitchen we finished yet! It will be like buses – all at once. 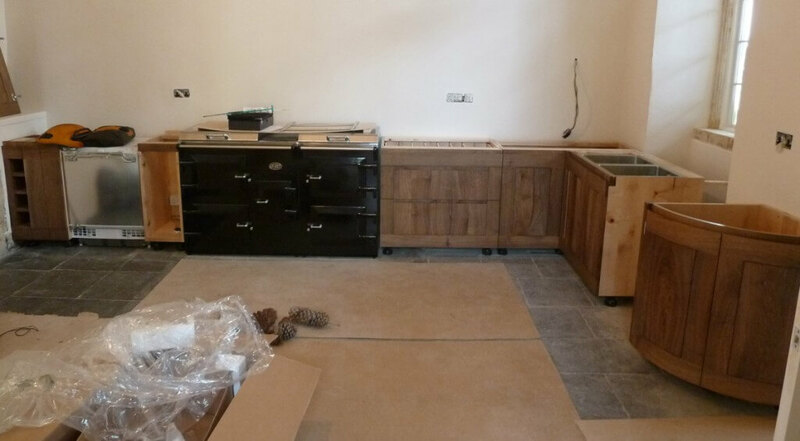 I’ll blog some more images at the end of next week, by which time it should look much more like a finished kitchen.